Begonia luxurians will grow to eight feet tall in a good location. The Palm Leaf Begonia prefers a protected location with light shade and rich soil or at least afternoon sun protection. Begonia luxurians will be damaged if temperatures dip into the 20°'s though will survive to the mid-20°'s. The leaves of the Palm Leaf Begonia are susceptible to wind damage. The large two toned umbrella-like leaves can make a garden look very tropical. 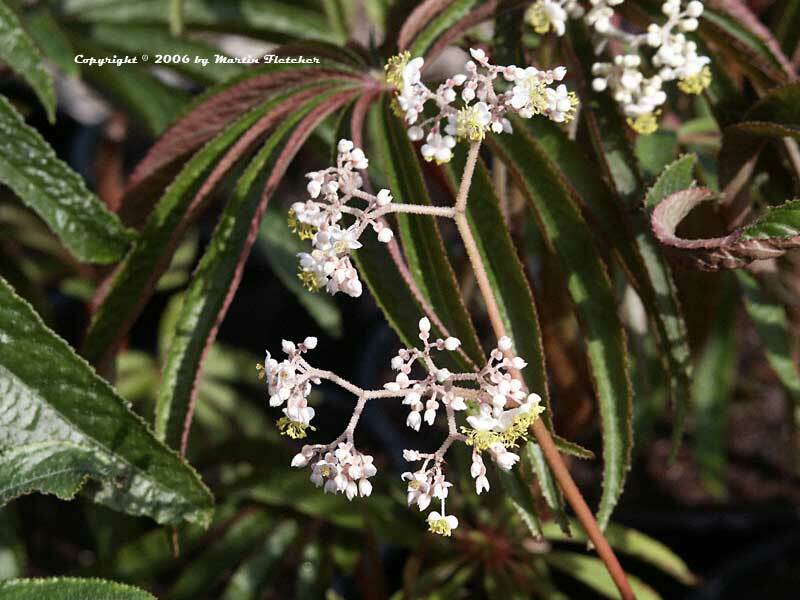 The water requirements of Begonia luxurians are far less than the tropical look implies. Water Begonia luxurians at the base, water on the leaves can cause mildew. The white flowers of the Palm Leaf Begonia are held upright at the tips of the branches. Flowers and foliage of Begonia luxurians the Palm Leaf Begonia. High resolution photos are part of our garden image collection.